When it comes to monitoring hours of service (HOS) in the trucking industry, time not only equals safety, it equals cost savings and a way to optimize your fleet operations. Driving five-ton vehicles over many hours can be stressful and create unhealthy working conditions for commercially licensed drivers. One way to reduce the stress is by removing some of the manual tasks that truck drivers are required to do. They are responsible for the paper logs for hours of service, driver vehicle inspection reports and other duties. What if there was a better, automated way to manage their time spent behind the wheel? Telematics paired with an electronic logging device (ELD) system brings a holistic and real-time view of trucking fleets of all sizes. The Federal Motor Carrier Safety Administration (FMCSA) is addressing the problem of inaccurate or incomplete records of duty status with its mandate that all commercial vehicles that are in operation for over 100 air miles from their assigned work location to adopt ELDs by December 18, 2017. This move not only will create seamless compliance with the law, with ELDs providing a high level of transparency to FMCSA, but it will cut down on the need to rely on paper HOS logs except as a backup or an exception. The mandate provides a strong incentive for drivers and carriers to convert to this much simpler, shorter process. These ELDs are more sophisticated technology-wise than the automatic onboard recording devices (AOBRDs) that some trucking companies adopted. This simple solution only tracks things like engine use, road speed, miles driven and timestamps. ELDs sync directly with the engine of a truck, providing engine power status, vehicle motion data and vehicle location, in addition to an AOBRD’s features. Instead of just looking at HOS, ELDs allow companies to automatically log records of duty status (RODS), which includes sleeper berth time, on-duty data and off-duty records. To be effective, these solutions must be as easy to use and deploy as possible and offer reliable connectivity. And, they must be compatible with any light, heavy-duty and long-haul vehicle manufactured after 2000 — nearly a generation of trucks that were never originally manufactured with the intention of connectivity. Seamless connectivity is at the crux of CalAmp’s business — at the core of a concept we call The New How, which facilitates decision-making, resource optimization and road safety centered around connected vehicles and assets. 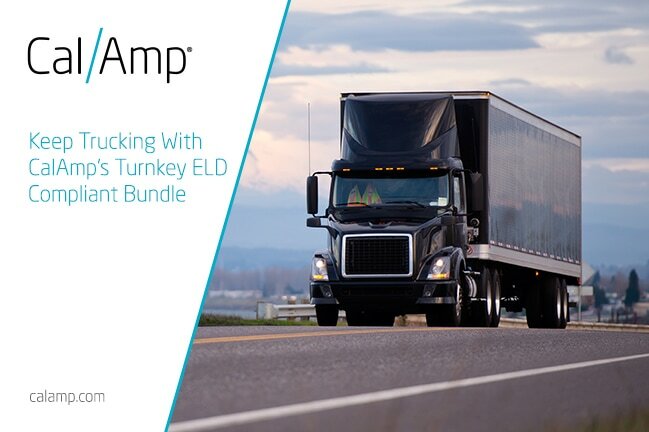 To provide an intuitive solution for commercial trucking companies, we’ve developed the V-Series ELD, a self-install bundle that includes a removable tablet, custom designed cradle with embedded telematics and a programmable LED malfunction indicator. Customers can choose a CalAmp or third-party Hours of Service (HOS) application available through our partners Pedigree Technologies and ATS Fleet Management Solutions.